Here’s the good news: Whether conflict is something that you have to deal with in a managerial position, or individually as a result of unresolved differences between you and a coworker, there are concrete ways of addressing the problem. There is one specific finding from the CPP study that can be of particular help when approaching the problem of workplace conflict. When asked to identify what they felt was the major cause of conflict in the workplace, 49% of workers surveyed by the CPP attributed the problem to a single cause: personality clashes. If nearly half of office conflicts hinge on a difference in personality, then wouldn’t it follow that nearly half of interpersonal conflicts could be solved through promoting an understanding of the way that different personality types interact? When introduced into the workplace, DISC and other personality testing tools can shed light on why people behave the way they do. DISC is an excellent way to foster empathy and understanding between dissimilar colleagues, and can provide concrete tools for resolving differences of opinion in a productive manner. Learning how to work with different personality types is an important skill—One that when encouraged in the workplace will make the environment more harmonious and productive. Conflict is going to happen. That’s the nature of a fast-paced environment where different people from different backgrounds are asked to collaborate. Preventing conflict isn’t always possible. But it is always possible to find a productive way to deal with conflict. When conflict is mishandled, productivity suffers. When it is handled in a constructive and proactive way, it can be a growth experience for everyone involved, and can actually increase creativity, efficiency, output, and morale. Here’s one final number for you: The CPP found that 7 out of 10 employees defined conflict resolution as a “critically important” leadership skill. 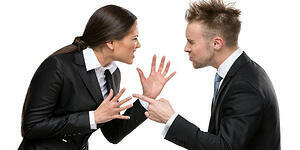 How sharp are your conflict resolution skills? Contact us to schedule live Conflict Resolution training. Make constructive connections between personality and conflict, and learn ways in which an understanding of DISC and personality types can directly improve the way you deal with personality clashes.